I’m not really sure which category this one belongs in, as it provides lots of different (simulated) effects. But going by the type of effects I mainly use it for, this is the place for it. I realized that I hadn’t used wah for a long time, and was considering taking it off the board and only bringing one to gigs where I knew I’d use it. At the same time, I wanted to expand my arsenal of airy, weird synth-y sounds, and started looking at the EX-7. If it could do a passable wah sound as well as all the other sounds, it might be something for me… It turned out great. Of course, the wah isn’t anywhere near as juicy and organic as the real thing, but it’ll do for the (very few) gigs where it’s called for. The Space Station model is great, while the Whammy model probably won’t get too much use. If I want a lower octave, the Octron is much better. But being able to manipulate the pitch with your foot could come in handy, I suppose. The Uni-vibe model is the weakest, IMO, and didn’t win me over. The leslie sim is another effect that I have better ways to achieve (sticking my Korg G4 after the pedalboard sounds much better, not to mention using my real leslie cab), but if I quickly need to imitate an organ, the EX-7’s TS-9 + leslie sim combination will do a passable impression without having to carry additional gear. The ADA flanger simulation sounds good, but as you can’t control the output level, it tends to lose a little volume. The pedal doesn’t change the dry tone too much – I did several blind tests, switching the EX-7 in/out from a true bypass loop box with a buffered pedal right after it (to take the cable to the amp out of the equation), and it wasn’t immediately apparent when the pedal was in the chain or not. There was maybe a slight difference, but not enough to cause any worry. I guess it will come down to how much you use it – if it only gets used a few bars per gig, a TB loop box might be in order to get it out of the chain when it’s not in use. If you find more use for it, so it will be activated a lot more, it can just be left as is in the chain. This is a relatively new wah, sporting the rev. G Crybaby circuit board (the JH-1 uses the same circuit board as the regular GCB-95). Or, that’s what it was before I started modding it… I started with the regular Stinkfoot wah mod, and replaced the stock inductor with a red Fasel (the Dunlop one, which comes in most new GCB-95 pedals). The transistors were then replaced with BC109B’s – I happened to have some lying around, and while they do make the pedal sound a little sweeter, it’s not enough of a difference to make me start hunting for NOS transistors. 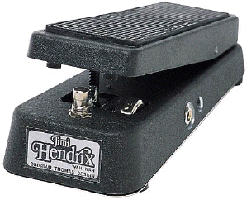 The pedal also has a Fulltone wah pot – the stock pot was on the way out, and I once again happened to have the part in a drawer – and a status LED. Vintage – manufactured by Jen in Italia. I have no idea what year it might be, but the guy who gave it (yes!) to me played guitar in the late ‘60s and early ‘70s. He approached me one day at work and said that he had some guitar stuff in a box in the basement, and wondered if I might be interested. He then went on to tell me about all the pedals he had used during his “active” period, but he didn’t know their whereabouts. Some of them might be in the aforementioned box, but… All that eventually came out of it was this wah pedal (not bad, mind you) in pretty bad shape. I’ve since replaced the switch (wired for true bypass, naturally) and pot, as well as resolder all connections in an effort to make it a little more dependable. However, there’s still something wrong with the circuit board – it crackles badly with every little flexing, which points to a hairline crack in one of the pcb traces. I need to get that sorted, before I can use it properly. In the pic, it’s the one on the bottom of the pile (if you haven’t already figured that out). The other two are long gone. 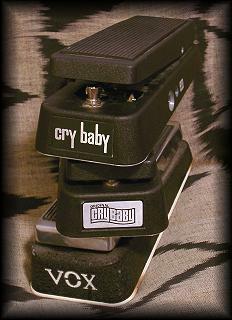 The middle one is a 1991 Rev F Crybaby I bought new, which was with me for the longest time, and was the first pedal I ever modified. The top one is a newer Rev G that passed through my hands at some point. I got this one off a sales ad here in Sweden, not really knowing why (what else is new?). I had just sold off the RoboTalk, and figured I might be able to put this one to use. Or not. Either way, it’s a cool pedal and the deal was more than decent, so I went for it. A while later, I came across another one for cheap in the classifieds, so I bought that one too, and ended up giving it to a bass playing friend who needed a ”Wow! What was that?” effect for a tour. My original one is currently used on the bass pedalboard. I had a big gig coming up, and needed a good compressor to help me bring my clean sound a little closer to my dirty sounds (overdrive pedals do compress the signal quite a bit). So I built a clone of the grey Ross compressor, and of course it didn’t work properly… (one of these days, I’ll get around to trouble-shooting it – I promise :)) At the same time, I was talking to a friend about compressors for bass – he had a Marshall comp that he was thinking about selling, and I thought I might as well… I modified a Boss CS-3 for him to try, and brought the Marshall home. After a quick spin with it, I realized that I wasn’t going to let him sell the Marshall comp – it only needed a few mods to fit the lower bass frequencies, and then I needed to get another one for myself. What a gem it turned out to be! It was very transparent sounding, with just a slight reduction in the top end, and with some careful dialing I was able to make my clean sound sit perfectly in the mix (the same way the dirty sounds does). One time, my local music store decided to sell off their ex-demo EBS pedals. So I quickly snapped this MultiComp up, and ended up paying just above half the list price 🙂 This is designed for bass (obviously, being an EBS), and that’s also how I use the pedal. But I also keep hearing how well it works with guitar, so the rest of this text will be focused on that aspect. Soundwise it is very clean. You get three different compression settings (further attack/release time tweaks can be made inside), and while I was afraid I’d miss having a pot for the ”sustain” setting, the three positions seem to be just right. I run it in either low or mid compression mode, with the blend knob at around 1-2 o’clock. So you hear mostly the compressor, with just a little of the original attack mixed in. I have also set the attack time to a slightly longer setting (via the DIP switches inside), to bring out even more of the initial attack. The one grief I have is the transparent knobs – while they look really cool, the novelty quickly wears off, as it is quite hard to see the knob settings at a glance. The octave up is a completely different affair – once again, it’s an analog octave effect, but much more related to the legendary Octavia than any pitch shifter. It spits and grinds, and sounds downright awesome! Not quite as ”dirty” and ring modulator-ish as a true Octavia, but not far off. And if you want the upper octave to be a little more well-mannered, it will do that too. 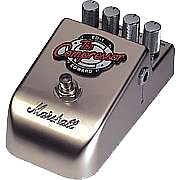 I tend to use the pedal either as an octave up screamer – when fed into a low/medium gain overdrive, the Octron takes on a whole new angry personality – or as an octave down unit with the dry signal mixed in. I never use all three octaves at once, or just the lower and upper octaves – not because it sounds bad, but simply because I don’t have any use for those sounds. Used in the bass rig. I usually run it in the ”low range” mode, with the ”normal” pot fully up and the octave about halfway up. 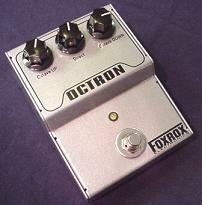 This is the best octave down pedal I’ve ever tried on bass (I love the Octron too, but haven’t tried it with bass). It seems to keep track of the notes far longer than the Boss OC-2, which makes it infinitely more useful. It can be used more as a sub-octave filler, part of the core tone rather than a spectacular one-off effect. 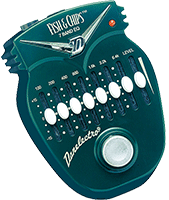 I don’t miss the 2nd octave down either – the one provided by the OctaBass is just fine. 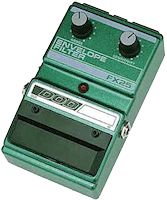 I did use it as a volume booster for solos, and ran it from a 5-way true bypass loop box to turn it on/off. It is currently not in use, but when I need a more transparent boost – and especially if I also want to shape the tone a little – the Fish & Chips will be right there. A good tool to have, as mentioned. 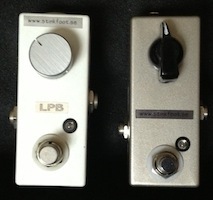 The white one is based on the very old Electro-Harmonix LPB circuit, and stuffed in a small box. The LPB circuit is dead simple, and yet very toneful. It runs flat out at all times – the knob controls the output volume, not the gain of the amplifier stage – so it does add a little sag and clipping to the signal. Not the most transparent of boosts, but certainly not without character. I like it! 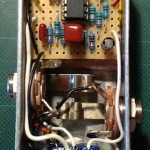 The silver one is another small size box, this time with a Micro Amp circuit built on veroboard. I used a vero layout by IvIark (thanks! ), and you can take a peek inside it by clicking the pic to the left. Tonally, it is a little cleaner than the LPB, and works well as a clean booster after distortion.